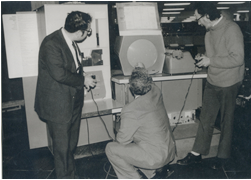 The first video game ever was made in 1961 and the first home console, the Magnavox Odyssey, came out in 1968. Gaming didn't really hit the mainstream until the Atari was released in the 70's and people quickly started amassing larger collections of games. As new systems came out people added to their collections and tried to find games they had missed on previous consoles by going to flea markets and garage sales. People started to get an idea for which games were hard to find, which were fun and which games to avoid. The game collecting subculture needed a place where they could discuss games together and put all this information in a central place. Enter Joe Santulli and Sean Kelly. 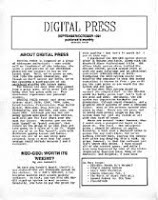 In 1991 Joe Santulli published the first issue of Digital Press newsletter. The first edition contained a checklist of Atari 7800 games, a list of great games that people had forgotten about ('Closet Classics'), a comic, reviews, a classifieds section, and more. Future issues would add color images and eventually price guides and more comprehensive game lists for every console. The newsletter publication would eventually become the DigitPress website, one of the biggest communities of game collectors online. The site contains a list of video games for every console, information about each game, and a rarity score for how hard it is to find. That same year Sean Kelly started the first BBS (Bulletin Board System) for classic games and hosted it on his Amiga. It was the first time collectors from all over the country could discuss game collecting in one location, even if it was only electronic. Eight years later in 1999 Sean Kelly and a friend Joe Hardie decide to host a video game convention in Las Vegas so collectors could meet in person to talk, buy, and sell games. It was called the Classic Gaming Expo. The inaugural event brought together nearly a thousand collectors, vendors, exhibitors, and gamers. The next year Joe Santulli joined with Sean and Joe in hosting the convention. The Classic Gaming Expo is now the largest video game collecting convention in the country and is in it's 13th year. As the hobby grew the amount of information and expertise required grew as well. There was demand for console specific collecting sites with more information like screenshots, cover art, more accurate rarity values, and a community that focused on a particular aspect of game collecting instead of the entire hobby. In 2001 Albert Yaruss launched AtariAge which has become the pre-eminent site for Atari collectors. And in 2006 Dain Anderson started NintendoAge.com. NintendoAge alone has more than 8,500 members and six of the 26 Nintendo World Championships Gold cartridges are owned by NA members. Sega has its own community as well at Sega-16.com. As game collecting as grown so have the prices collectors are willing to pay for the rarest games. In 2007 the Nintendo World Championships Gold was selling for $5,000. In 2009 a copy of Nintendo Campus Challenge sold for $20,100. Records continued to be broken in 2010 as a sealed copy of Stadium Events sold for $41,300. Where will video game collecting go in the future? Will it become as popular and mainstream as coin, baseball, or stamp collecting? Let us know where you think game collecting is heading in the comments below. I hope it doesn't become mainstream because that will most probably drive the prices up. I hadn't realized game collecting has had such a healthy community for so long. It looks like video game collecting is already more popular than baseball cards and comic books (http://bit.ly/z3yXwD). I bet it'll continue to grow as the younger generations acquire more disposable income. If it ever passes coin collecting, I'll be really surprised. @mndrix - Very interesting to see the google search data comparing those four hobbies. Strange that coin collecting is that much more popular. @BRIK - that is very true that it will drive up the prices even more if it becomes more popular. At least you are in on it now so you can benefit from any increase in price. I like collecting, and of course I understand I dont buy a game to play it, I buy it to own a piece of history, but playing it is part of it. Playing it is a fairly large part in fact. For coins, baseball cards, 100% of the desirability comes from the original itself and almost 0% enjoyment would come from a copy. For games, its more like 50% comes from it being a piece of history 50% comes from it being fun to play, so I do think copies hurt us more than it would hurt coins are cards. Video games are ideal from a collecting standpoint in that they are such a huge part of our childhood identification--the whole Rosebud, Citizen Kane thing--and that's what people in their 40s and 50s go for: their childhood/teenage years. However, sports cards gave us a fairly recent blueprint of what NOT to do, and what could severely hamper a collecting community. For example, in the early 1990s there were LOADS of sports cards companies putting out their "rare insert" cards that a lot of card collectors ended up chasing. At the same time, we also had Beckett's price guide, Tuff Stuff, and a few other select guides there were used as the standard to determine how much a card was WORTH. Fast forward a number of years, and no surprise we had more than a few collectors absolutely pissed to find that when it came to actually SELLING their cards, no one was willing to pay what the Beckett's and other guides said the cards were "worth." Collectors were finding the cards they thought were so valuable--many of which were years old "chase cards"--were worth a fraction of what they cost to purchase. Collectors lost money hand over fist. Remember, too, all those sports cards companies that popped up were charging very high prices for those packs of cards many of us bought. Finally, the bottom dropped out on the sports card collecting community due to greed and not allowing one simple principle to exist--let the market determine what something is "worth." With all the new premium, limited, collector sets and games coming out with each new video game release, I smell the same greed that eventually dealt a huge blow to the sports card collecting community. Fortunately, price guides are not driving the price of what video games sell for, it is the collecting community itself. Ebay tends to give us a pretty good idea of what games are worth, and I believe Ebay also tends to be the upper end of what games are actually worth given a nationwide/worldwide selling base. SO, I believe that having an essentially free market system in place, and the absence of price guide standardization, is critical to keeping collectors in the mix and not becoming disillusioned. Video Game Price Charts is ideal in that the sales are what is being reported and reflected. Now I believe what is really needed to infuse the video game collecting community is the same thing that keeps book and many other collecting communities healthy and vibrant--objective information and knowledge with regard to rarities, variants, and print numbers. This seems to be the biggest piece, to me, that is lacking and keeping video game collecting from really taking off. Maybe that task will be for future 40s generations to research, explore, and report. But when and if that ever happens I will know that video game collecting as a true collectible hobby will have landed. @anonymous - Great comments and insight comparing the video game market and baseball card market. I never got really into card collecting but I always wondered where those prices came from when I checked a price guide at the library or book store. I really wish game publishers would give their print sizes or total number of units sold, etc. It would be great to see that data and know for sure which items are rare and which are not. The video game market, as I've seen it, is most closely tied to the old toys market. It's a nostalgia market. My guess is that certain games will peak when the people that play with them get to be about 35, but then will trail off. This happens with every type of toy; GI Joe from the 60s used to be the gold standard of collectible toys, but as collectors either completed their collections or died off his value has dropped considerably. Dinky toys from the 20s were the same way. Now the top of the toy heap is Transformers, and it's no surprise considering the age of the collectors. The toys that maintain their value through the ages are few and far between, and I suspect it will be the same way with video games. I do wonder which games will maintain their value past their natural prime. My bet's on legacy games, like a sealed copy of The Legend of Zelda. Perhaps in 50 years that will easily eclipse a sealed copy of long-forgotten games like Ducktales 2 or Stadium Events. After all there are rarer comics than Action #1, but they don't sell for a million bucks. I agree that nostalgia plays a big part, but it's really only one aspect. Different platforms and certain games or particular franchises will probably change and peak over time, depending upon which generation of collectors are driving up demand for which platforms/games/franchises as they age. However, toys and different types of toys have been around forever and are very strongly correlated with the nostalgia factor in terms of "value," but video games have not and probably won't be dependent upon it. Video games have a beginning that is based on emergent technology, and the tech evolution tends to be very linear with the video game timeline. And the whole video game/internet birth is its own cultural phenomena that has had probably the biggest impact on the world, both in terms of how it turns and how it lives and recreates since...I don't even know what other major development. So, video games will appeal to collectors as their own niche without dependance on nostalgia coming in to play since it is its own niche. I expect collector interest in technology, particularly over time, will be its own driving force for generating continued and expanding interest in video game collecting. But basically, there are numerous reasons why people might decide to or just start collecting video games apart from the obvious, the rest depends upon what else (other than playing games--like we need another reason) makes video game collecting a fun and challenging way to fulfill our little "pursue and conquer" and covetous urges. First editions, variants, different mint marks, award winners, special editions, favorite players/franchises--there are lots of different things that can come into play that has pertained to coin, stamp, sports card, book, and toy collecting over the years that can be applied to video game collecting. The question to me is, can that information be culled and obtained and USED, since that's really what helps make collecting fun and evens the playing field--accepted and agreed upon information. The monetary value associated with certain rare platforms (that likely has little nostalgia or game play appeal associated with it--Vectrex, I'm talking to you) is enough to prove to me that niche is enough, at least for now. Not to mention, just having a working system, like a Coleco Telstar Arcade, commands a significant premium over non-working systems, so just FUNCTION in itself is a collecting aspect. 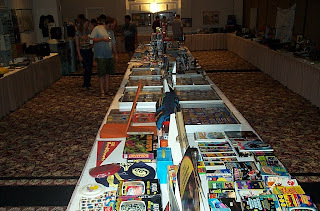 Merchandise and memorabilia are a whole other facet and may be more subject to the nostalgia factor, as well as having more monetary value potential. The biggest jumps I've seen in prices are actually around memorabilia. Although my biggest regret so far is still underbidding by $20 a Nintendo M82 store display that sold for only $200 in 2003. And that was the going rate less than 10 years ago. Amazing.